On October 23, a Diet Study Session called by Diet member Mr. Yokokume on the problems of parental abduction and custody determination in Japan’s family law and family courts was held. The session ran a bit like a symposium combined with a press conference. For the first time, Mr. Yasuyuki Watanabe spoke publicly about his case , naming the judge whose conduct, decisions and failure to follow the latest, best practices of the law as set out in revisions of the civil code exemplifies the problems of child abduction and elimination of parental rights for which Japan’s family courts have been bitterly criticized both within Japan and internationally. Mr. Watanabe and numerous other parents seek relief in the form of new law to guarantee the security of the parent-child relationship. Law Professor Colin Jones also spoke, as well as several others. 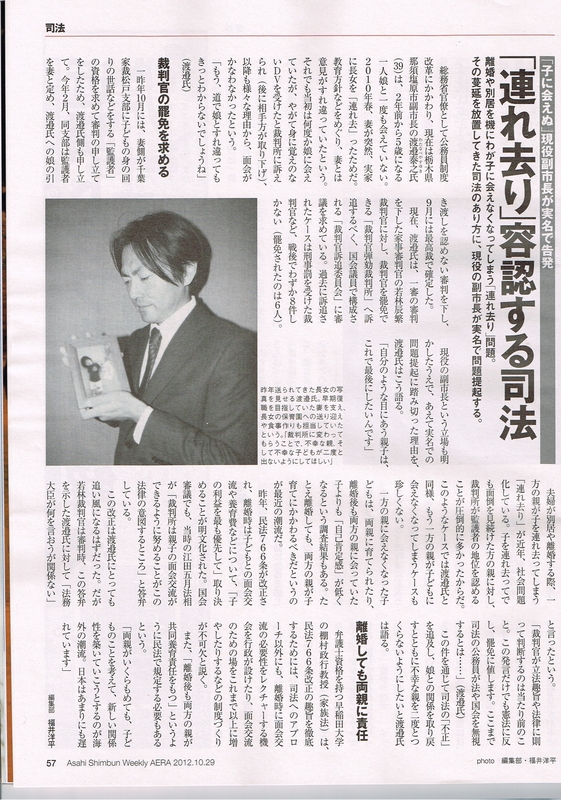 Prior to this event, Mr. Watanabe had taken a case to the Supreme Court where he asked for custody of his daughter. The significance of the Diet Study Session is that a member of a government bureaucracy was making a very trenchant declaration; he is an official in the Ministry of Internal Affairs condemning the family law system and by extension the Ministry of Justice, and is naming the judge in his case [Wakabayashi] publicly, bringing forward that the actions of this judge as well as others are grounded in past practices which are no longer legally justifiable, and should not continue as they have been. The continuation of the practice of nearly automatic termination of parental rights by Japan’s family court judges is defiantly misguided. The judge in this case made disdainful comments in the course of the custody hearings which implied that by virtue of his position as a sovereign family court judge, he could and would ignore with impunity the statements of former Justice Minister Eda in Diet testimony in which he urged that an agreed revision of the family law be implemented and adopted immediately. Essentially a statement of the institutional and personal autonomy of his court room, the judge sidestepped agreed upon change in civil code article 766, which now requires a divorcing couple with a child to specify visitation arrangements between the child and the father and mother, in addition to custody. These are guidelines that the family court was and is supposed by the Diet and Supreme Court to have followed. But the judge in this case, as have judges throughout the system, simply resisted the guidelines. This reveals a disconnect between the Minister of Justice and the bureaucratic family law judges within the Ministry of Justice, and implies a certain willful disobedience of the intention of the law on their part. Even actions of the Supreme court and the admonishments of the Minister of Justice are ignored by family court judges who have self-interest and a “tradition” of their own making on which to rely. Resistance to change in family law becomes complex very quickly. The State, seeking legitimacy through its public pronouncements, wants to be able to say it is protecting its families and its citizens; yet it alternately collaborates with, seeks support from, or steps aside for practices in civil society which undermine family stability and seek to impose private interests over those of citizens, thus turning working life and the evolving material of citizenship against family, community and neighborhood well-being. As a consequence of the State’s obsequy before interests which seek to see civil matters in maximally private terms (forcing the withdrawal from citizens of state protection against the power of those interests, such as those which may be financial and geo-political in origin ), it is then politically doubly-difficult for these State institutions to reform so-called “private” matters of family law. In the end there is antagonism and conflict of loyalties within the direction pursued by the State. There is a small but growing number of citzens such as Mr. Watanabe who are working to compel the Diet to create a real family law code, to pressure the Ministry of Justice to enforce the kinds of procedures needed to eliminate the abuse to which parents and children are subject under the current regime. This is occurring in the context of a small rebound of activism amidst an increasingly polarized Japanese public for the first time since the 1970’s as a consequence of the triple disaster and nuclear accident of 2011, the corruption evident in Japan’s energy politics, and popular outrage over U.S. military bases in Okinawa. Noisy nationalists are also very much on the rise, much to the detriment of Japanese political affairs. In an era in which institutions of the nation-state whose real sovereignty over matters of economy and society are rapidly waning, and whose accountability to the public has precipitously declined, this brings along with it very serious problems of legitimacy for the State. Japan’s is not an exceptional case in this regard. But the abuse and misuse of judicial practices in Japan’s family courts is more than noteworthy. It is endemic. 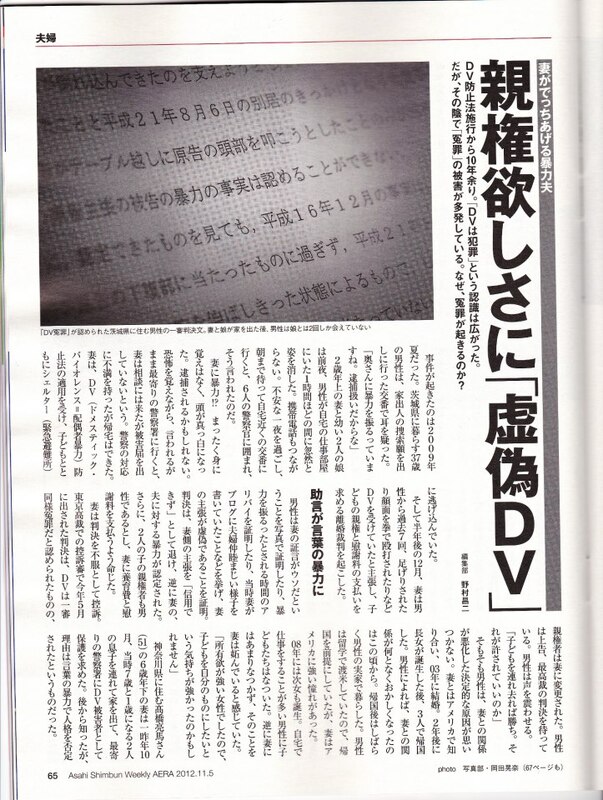 Press coverage of this controversy, particularly as regards abductions and the abuse of family court, is increasing, in Asahi, Yomiuri, and AERA news magazine. I am no longer able to see my daughter because of the divorce and separation abduction machine problem. A deputy mayor using his actual name raises an epidemic problem that has been neglected by the judiciary. A bureaucrat in the Ministry of Internal Affairs and Communications named Yasuyuki Watanabe (39) involved in the reform of the civil service system, currently the deputy mayor of Nasushiobara, Tochigi Prefecture, said that he has not been able to meet his 5-year-old daughter even once for the last two years. It is because of her sudden kidnapping in the spring of 2010 to the house of his wife’s parents. This was over a disagreement with his wife about the education of their daughter. 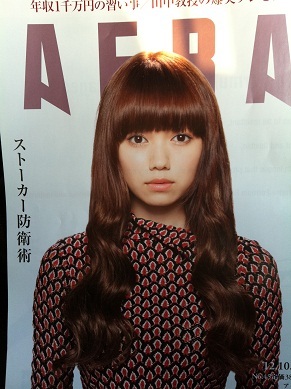 Mr. Watanabe says “I can no longer identify my daughter when I see her on street.” Mr. Watanabe also petitioned against the decision of the Matsudo, Chiba Family Court judge to grant custody to his wife and not to allow the delivery of their daughter to Mr. Watanabe in February this year. The Supreme Court dismissed the appeal by Mr. Watanabe in September. Currently, Mr. Watanabe is seeking an impeachment trial consisting of Diet members deliberating in committee to be able to prosecute and dismiss judge Tatsushige Wakabayashi. Mr. Watanabe said that he dared to raise these issues revealing his real name and position as a deputy mayor. Nowadays, “Abduction”, where a parent takes his/her children when the parents separate or divorce, has become a social problem. Courts never fail to furnish custodial rights to the parents who abducted their children. In such cases, left-behind parents like Mr. Watanabe often can no longer see their children. According to research, children who cannot see either of their parents lose their self-esteem much more than those who can see both parents after divorce. Recently, people are more likely to think that both parents should take care of their children. Mr. Watanabe states that he wants to take his daughter back and stop the production of unhappy parents and children though this impeachment. Mr. Masayuki Tanamura, a lawyer and professor at Waseda University, says that in addition to the approach of justice, (family law), in order to ensure the intent of the amendment of Article 766 of the Civil Code, the government must provide a lecture on the need for visitation at the time of divorce, and increase visitation opportunities. In addition, “the responsibility of both parents in joint custody after divorce” and so on must be defined in the Civil Code. You have a friend in Madrid… Supporting you ! And a friend in Texas .